You know that awkward stage when you’ve just started dating someone and you go over to their parents’ place for dinner? Everyone’s smiling and making small talk about the weather and you’re basically worried about sounding coherent and likeable at the SAME TIME? Well, one of the first times I went over to Mike’s family’s house, his mom prepared a massive Vietnamese feast. Luckily, it didn’t end in tears, like the time we all ate spring rolls together. Mike had told his mom beforehand that I love Vietnamese food. Which is true. The thing about Vietnamese food, as I’ve learned over the years, is that it can be pretty family specific. Some families will roll their salad rolls in their hands, some will use a plate and some will let their mom roll everything before they even make it to the table. In Mike’s family’s case, they grill their protein at the table (using a handy indoor grill), dip their rice paper into steaming bowls of water and wrap up their rolls on plates. Basically, it’s a grill it, assemble it, roll it, eat it sort of thing, all at the kitchen table. On this particular evening we were sitting down to grill lemongrass beef for salad rolls (or Summer rolls, or Spring rolls or fresh rolls). On the table, there were the usual suspects, a giant bowl of fish sauce (ruby red from an absurd amount of chilis), a second bowl of fish sauce (specifically made for me with fewer chilis), vegetables, the raw meat, herbs and a HUGE bowl of vermicelli. This was my first time having salad rolls that didn’t come pre-wrapped in saran and I wasn’t too sure what went where, so I just followed along. Side note: don’t ever let a Vietnamese person fool you into thinking that your salad rolling skills don’t matter. They do. They’re over there, expertly rolling vegetables, meat and whatever else into incredibly tissue thin rice paper rounds watching you to literally see HOW YOU ROLL. Luckily, I have a lot of experience rolling spring rolls for my mom, so my rolling action is excellent. Anyway, the Le family way of rolling goes like this: put a bunch of meat on the grill. Dip your round rice paper into a shallow bowl of hot water. Place it on your plate. Start layering on vegetables and herbs. Top with meat, roll and dip. I didn’t see any vermicelli enter the equation, so I just went with it. After about six or seven rolls, my curiosity got the better of me so I asked Mike what it was for. Me (in a whisper): So, what’s the vermicelli for? Mike: Oh, that’s for you. Me (still whispering): What do you mean, it’s for me? Mike: My mom thinks all non-Vietnamese people like vermicelli in their rolls. Me: Hmm…that is true, all the other rolls I’ve eaten have had vermicelli in them. Mike (laughing): Well you better get rolling. She totally expects you to eat all of that. I wasn’t sure if Mike was joking or not, but I didn’t know his mom well enough to not eat the intended-for-me-vermicelli, so I had a go at it. It wasn’t hard, at least at the beginning. I was hungry and the rolls with the vermicelli were delicious. But twenty rolls later, everyone was slowing down and I had yet to make a noticeable dent in the noodles. Mike’s mom: You don’t like the vermicelli? Me: No, no, I LOVE the vermicelli! Mike’s mom: You didn’t eat any vermicelli. Me: I did! But I’m getting quite full. Awkward silence. Luckily, Mike came to the rescue and told his mom that’d we’d take the vermicelli home. I fried it up the next day with the leftover lemongrass beef and it was delicious. I love vermicelli, but I love quinoa just as much. So, when the thought of a giant bowl of vermicelli is just too much, go with this quinoa bowl. It’s light and tasty and the texture kind of reminds me of another Vietnamese favourite, broken rice. 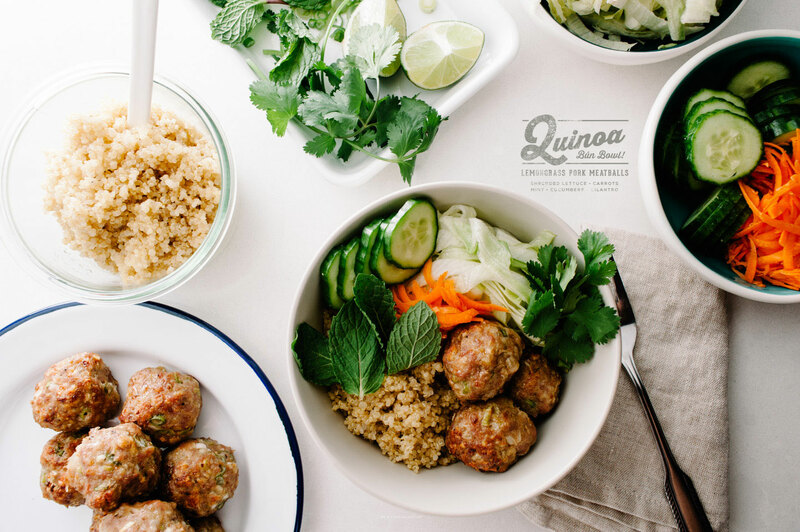 Quinoa is fantastic in salads, so it’s no surprise that it’s delicious as a substitute for the noodles in a bún bowl. Bún are super simple affairs: vermicelli, a bunch of herbs and vegetables, a protein and a whole lot of fish sauce to pour on top. 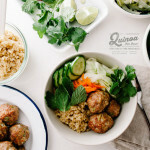 My protein of choice are definitely these lemongrass pork meatballs. They’re super quick: just mix all of the ingredients together gently, shape and bake! You could pan fry them on the stove, but popping them in the oven gives you some time to prepare all your vegetables or do a quick wash up. They’re juicy and flavourful on their own, but throw them in a bún bowl and you’re gold. Preheat the oven to 375°F. 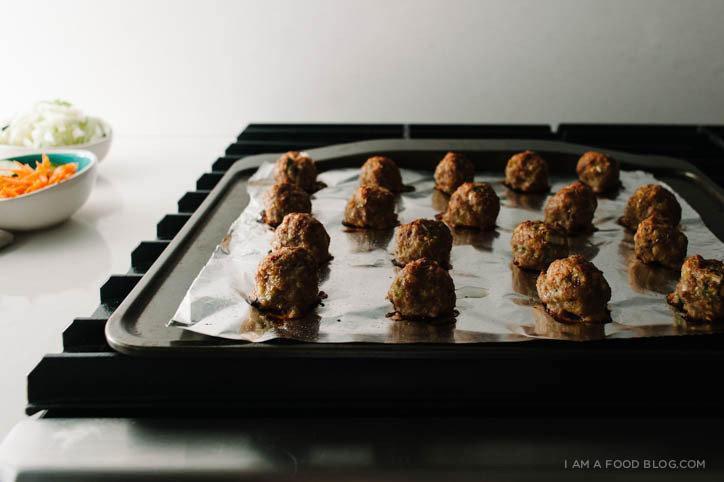 Gently mix together all of the ingredients and shape into 1 inch meatballs, about 2 tablespoons each. Space out on a foil-lined baking sheet and bake for 20 minutes. Turn the heat up to broil and broil for 5 minutes for a bit of color. Remove from the oven and enjoy on your quinoa bowl, with vermicelli, on a sandwich, or on their own. Crush the garlic, chili and sugar together with a mortar and pestle until the garlic and chili are crushed. Add the sugar, garlic and chili to the water and mix well. Add the lime juice, mix and then stir in the fish sauce. Set aside in the fridge until needed. If you have the foresight, make this the day before and let the flavors meld overnight. Build your bowls: put one cup of quinoa in each bowl and top lettuce, shredded carrots, sliced cucumbers, cilantro and mint. 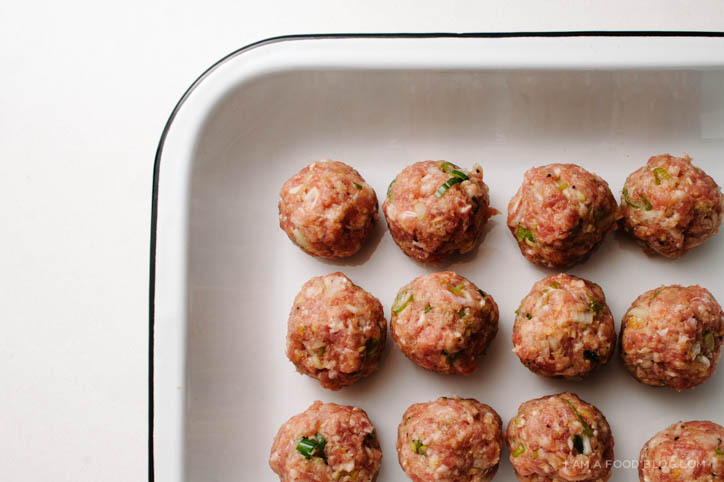 Add meatballs and serve with fish sauce vinaigrette on the side. Add fish sauce vinaigrette to taste and enjoy. Mad about meatballs? 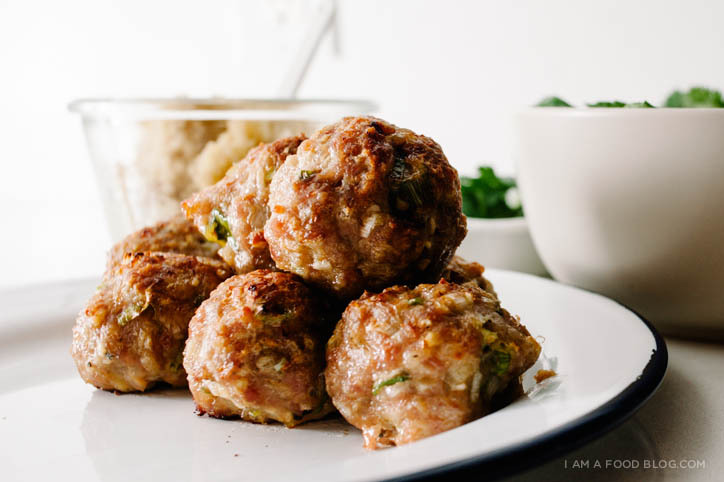 Try these out: Turkey Parmesan Meatballs, Swedish Meatballs, Fennel Pork Meatballs. I have to say, the thought of a giant bowl of vermicelli is never too much for me to contemplate. This looks incredible! I, too, LOVE Vietnamese food (actually, all Southeast Asian food), so this is basically Heaven to me. Totally pinned! YES! Southeast Asian has sooooo many delicious flavours! Omg dying. I had to click over to read the spring roll story, but this one is just as good. “…watching you to literally see HOW YOU ROLL.” LOL. I have many love/hate feelings regarding parental Asian food expectations and the sometimes hypocrisy (“you’re getting chubby”/”eat more! !”)…but pretty much all love when it comes to spring rolls, let’s be real. Hey Steph, I assume the meatballs would be okay to freeze? Best to freeze cooked? 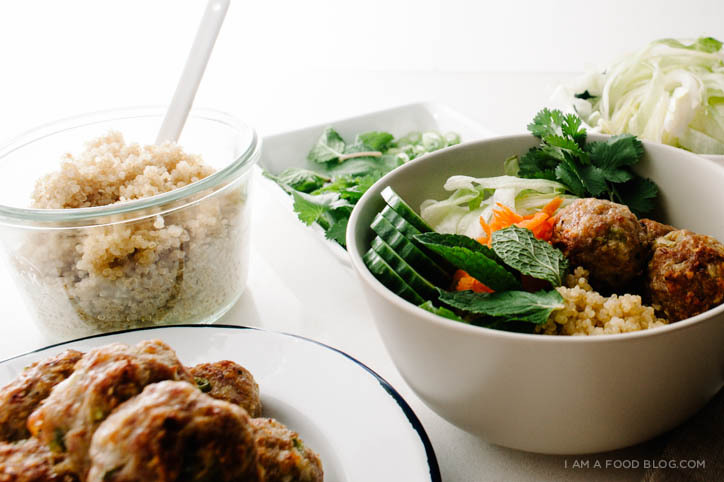 This whole bowl looks amazing but 18 meatballs might be a bit much for one person ;) Thanks! 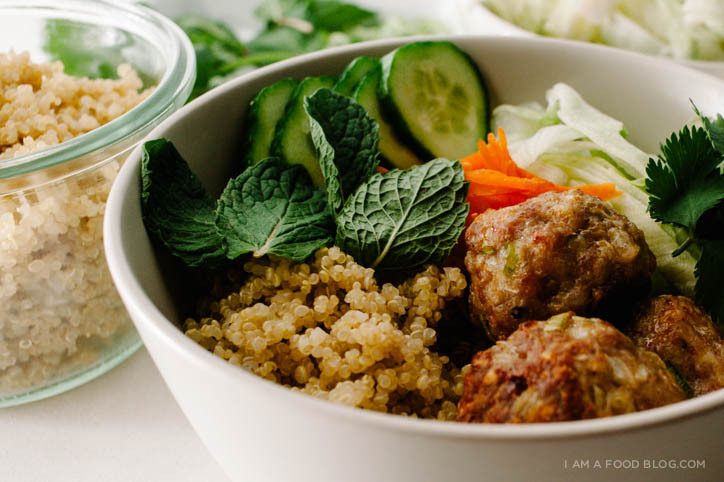 Love that you added lemongrass to these meatballs! Sounds SO good! I love meatballs. This bowl… needs to be what I pack for work lunches EVAR DAYYY! I’m so sorry you were under all that vermicelli pressure! Asian moms are not kidding around. Oh my God, this is HILARIOUS, Steph. This was amazing. And God knows we’ve all been there… haha. Second, I am obsessed with these meatballs. Adding quinoa is so genius. If I ever get up the courage to venture into Vietnamese food, this is on my list of things to try. I would very much like to copy the recipe- but being in a dark box like it is, I wasn’t able to do it. Is this a copy right technique or what? Haha I enjoyed this story almost as much as the gorgeous food photos! It’s always tricky joining a different family’s eating rituals. Please add me to distribution email list. Thank you. I’m working on getting an email subscription up and running, hopefully this month! I’ll keep you updated. 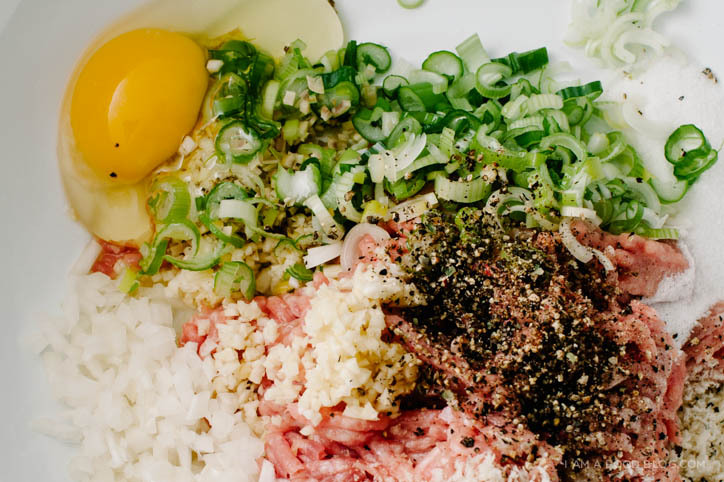 Could you take the ingredients in the meatball and turn them into a marinade for beef or chicken, minus the panko and egg of course? Maybe to make the lemongrass beef you ate at your mom-in-laws house? I haven’t tried, but I think it would work! Usually when I’m making a marinade for grilling lemongrass chicken I just eyeball things. But maybe I’ll put a post up soon! I subsituted key limes for regular limes in the Nuoc Mam and was quite awesome! I have had a try of these fantastic meatballs… D E L I C I O U S !!!!! Thank You for the recipe! I made this last night… we loved it. It’s going into the regular rotation. Thanks! About how long would the meatballs be good for? Made this tonight and turned out great – thanks for the inspiration! so happy you liked it erin!! yay!! so happy you liked it!! thank YOU for trying it out! Have to try this – great recipe! I made this last night. They were delicious! My boyfriend, who loves vietnamese food thought it tasted just like the stuff he’d get at a restaurant. I meant to comment on this dish ages ago…it’s fantastic! I love how fresh it is. It’s been officially added into my regular meal rotation. Thanks so much for sharing. You’re really good at what you do! Keep it up! My first time trying a quinoa bowl of any sort. Loved your recipe!